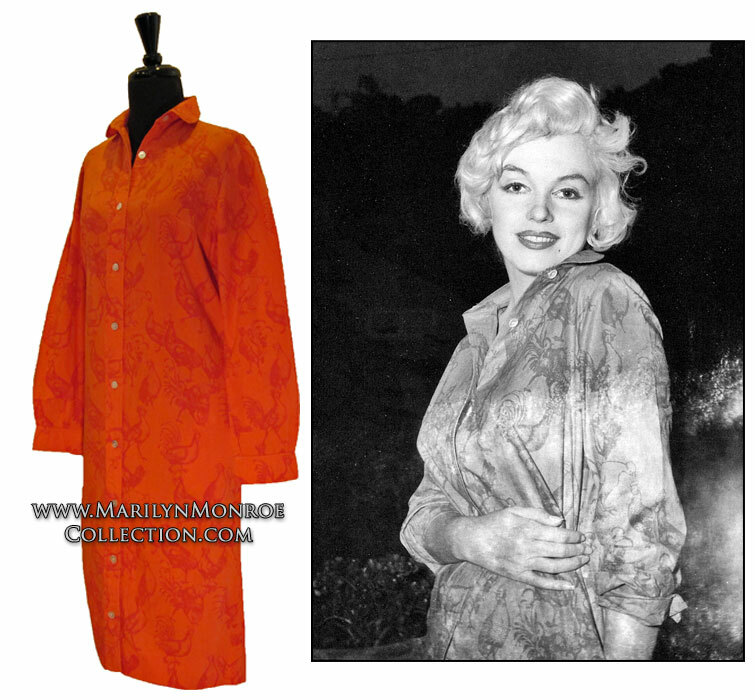 From the personal wardrobe of Marilyn Monroe: A red cotton button-down casual garment with a pattern of roosters and chickens, long sleeved with pockets at each side, worn as a maternity dress during Marilyn’s 1958 pregnancy during and after filming of Some Like It Hot. 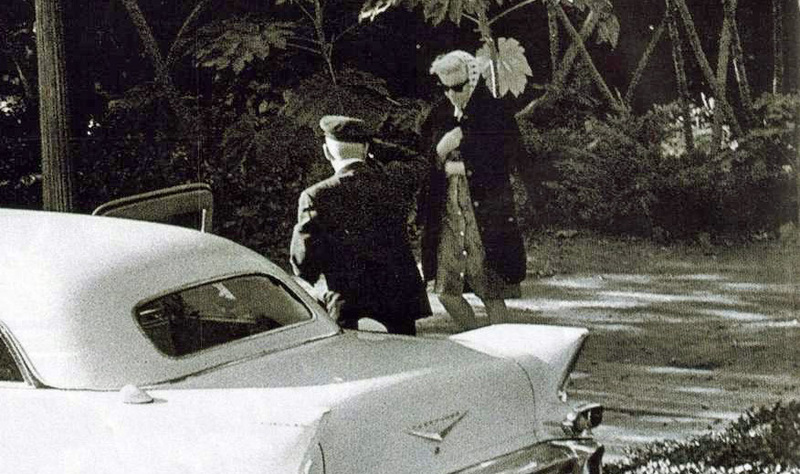 Note in the photo below Marilyn covering her stomach area with her right arm. It’s believed she was two to three months pregnant at the time of this photo. Page 405: Professionally idle, dependent on his wife’s income, humiliated by what he saw as her childish caprice and contemptuous of Hollywood in any case, Arthur could no longer tolerate her or the marriage. But there was another problem, and that autumn, the atmosphere on location in Coronado was thick with tensions. “Arthur told me he would allow Marilyn to work only in the morning,” (Billy) Wilder recalled. He said she was too exhausted to submit to outside work in the afternoon sun. “The morning? She never shows up until after twelve! Arthur, bring her to me at nine and you can have her back at eleven-thirty!” We were working with a time bomb, we were twenty days behind schedule and God knows how much over budget, and she was taking a lot of pills. But we were working with Monroe, and she was platinum – not just the hair, and not just her box-office appeal. What you saw on the screen was priceless. The reason for Arthur’s request was simple: in late October, the Millers learned that Marilyn was pregnant again. Fortunately, her most strenuous scenes were already shot and the filming of Some Like It Hot was completed on November 6. By this time, director and star were barely speaking. Page 407: Returning to New York before the end of November, Marilyn was determined to rest during the early stages of her pregnancy. But on December 16, she miscarried; it was the last time she tried to be a mother. Both for sleep and as a tranquilizer, she had been taking Amytal, a brand name of the barbiturate amobarbital, and now she guiltily recalled Leon Krohn’s warning, as she wrote the Rostens: “Could I have killed it by taking all the Amytal on an empty stomach? I took some sherry wine also.” For weeks she was inconsolable, convinced that the drug abuse she now freely admitted had caused the spontaneous abortion. Below, Marilyn Monroe walks to a waiting limousine and driver to be chauffeured from the Bel Air Hotel in Beverly Hills to the Warner Brothers lot in Hollywood during the filming of Some Like It Hot. She is wearing this dress in this photo. Her left arm covers her stomach and again her pregnancy is obvious. 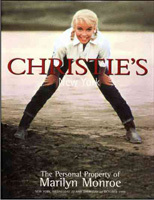 Christie’s New York: The Personal Property of Marilyn Monroe, October 27-28, 1999. Click here to buy your copy of the Christie’s auction catalog for the sale of Marilyn Monroe’s personal items.